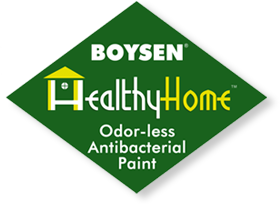 BOYSEN® Healthy Home™ is an odor-less, low VOC, premium acrylic, water-based interior coating with antibacterial protection to give extra defense against bacteria such as E. coli and Salmonella, as well as mildew and fungus. Because the antibacterial protection technology has been incorporated into the paint at the manufacturing stage, you can be sure that your homes will stay cleaner, safer and heathier throughout the life of the paint. Allow new concrete to dry for 14-28 days under normal weather conditions before painting. Surface to be painted should be clean and dry, free from oil, grease, dust, dirt, contaminants, and all loose grit and mortar. If the concrete has cured for less than twenty-eight (28) days, treat with a solution of one (1) part BOYSEN® Masonry Neutralizer B-44 diluted in sixteen (16) parts water, applying liberally by brush or roller. Let dry overnight before rinsing with water to remove white crystals that form on the surface. Let dry before painting. However, if the concrete has been cured for twenty-eight (28) days or more, there is no need for neutralizer. Surface to be painted should be clean and dry, free from dust, dirt, and other foreign matter. Hammer all nails deep enough to apply putty. Sand rough wood until smooth and then dust off before painting. Install and secure joints as per manufacturer’s recommendations. 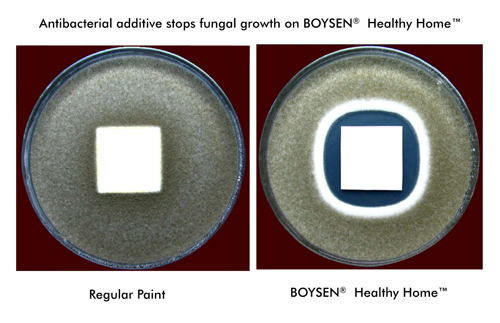 Scrape off all loose, scaling, flaking, and peeling paint manually or by using BOYSEN® Paint and Varnish Remover B-141, as necessary. Wash surfaces clean and completely remove chemical residue. Let it dry. 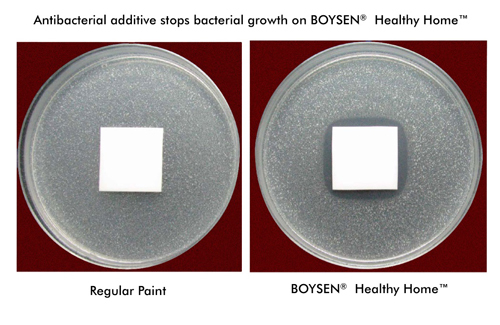 For repainting concrete, use BOYSEN® Chalk Blocker B-7304 as surface conditioner. In case of mildew infestation, treat with a bleach solution (1:3, laundry bleach to water, respectively) by swabbing or brushing. To ensure proper treatment, let stand for twenty-four (24) hours before washing off residue. Let dry. For repainting other surfaces such as wood, follow the first step then apply the appropriate primer before recoating. When the applied paint coating is fully cured, the antibacterial additive provides microscopic needles that pierce the bacteria cell wall on contact, killing it immediately. The action is physical rather than chemical, thus mutation of the bacteria will not progress.